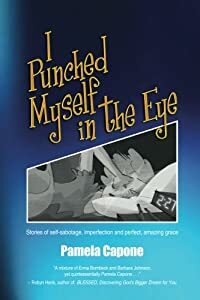 In her collection of personal, stand-alone essays, you will not only be entertained by her colloquial, quirky style, but surprised by the truths revealed. Putting her “quirk to work,” she blends humor and depth. This easy, transparent read will appeal to anyone looking for a little downtime. You will end up not only with that, but so much more. Live life! Break away from the mundane habits and predictable schedules of everyday living! Interactions with new cultures will transcend the limitations of your world. Should you be immune to the lessons life is waiting to teach? Let me introduce you to dozens of people to meet along the way, as you gain personal insights cultures, customs, and hints about the incredible changes taking place inside yourself from this type of exposure. The icing on the cake is the compelling photographs that take you through the daily life of an unfamiliar culture. A travel experience starts with the place and the sights to see. What you bring back in your treasure chest of memories will be experiences with people you meet along the way. I will hold your hand while you see, taste, smell and breathe the life of the people. This is not a show and tell guidebook to suggest where to go and what to do. It will open your eyes and tempt your tongue, as you taste traditional Moroccan bisteeya (a delectable three-layer sweet pie wrapped in the thinnest of pastries and eaten with three fingers). Your exposure to more traditional customs may cause you to change your lifestyle. After this safe, vicarious trip at my side, you will be packing for your second. 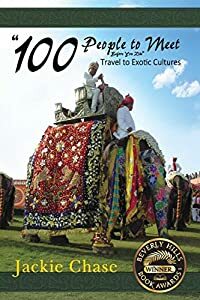 Whether you need inspiration, without venturing away from your known comforts to fill those gaps of discontentment, or you dare to let your imagination run free in exploring the world around you, you will want to keep “100 People” at your bedside or in your reading bag for your next flight. Jackie Chase has more than four decades of travel experience in and out of over one hundred countries. She has lived temporarily with remote tribal people in the populated continents of the earth and has written several books in this photo-journalism series about cultures, plus a Traveler’s Handbook that won a Royal Palm Literary Award. As the chergui (desert wind) whips reality into fantasy and the perpetually full tea glass caresses its minty bouquet, from Casablanca to Tangier, from the crush of Marrakech to the ethereal solitude of the Sahara, from a rose festival in the countryside to a betrothal fair high in the Atlas Mountains, in alleyways and on rooftops, in the souks and on plains scattered with ruins, we invite readers to join us as we rotate in a dervish-dance with Morocco. Thirty-three stories and poems--edited by Erin Byrne and written by Suzanna Clarke (A House in Fez), Jeff Greenwald, Michael Chabon, Phil Cousineau, Paul Bowles and others--vibrate inside this book, tales of quests and mysteries, of traditions and memory and wisdom that seek the ancient and celebrate the exotic in Morocco. 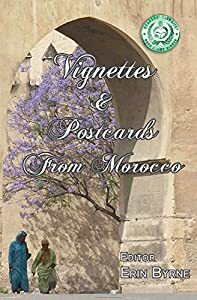 Vignettes & Postcards from Morocco is a Foreword Book of the Year Finalist.